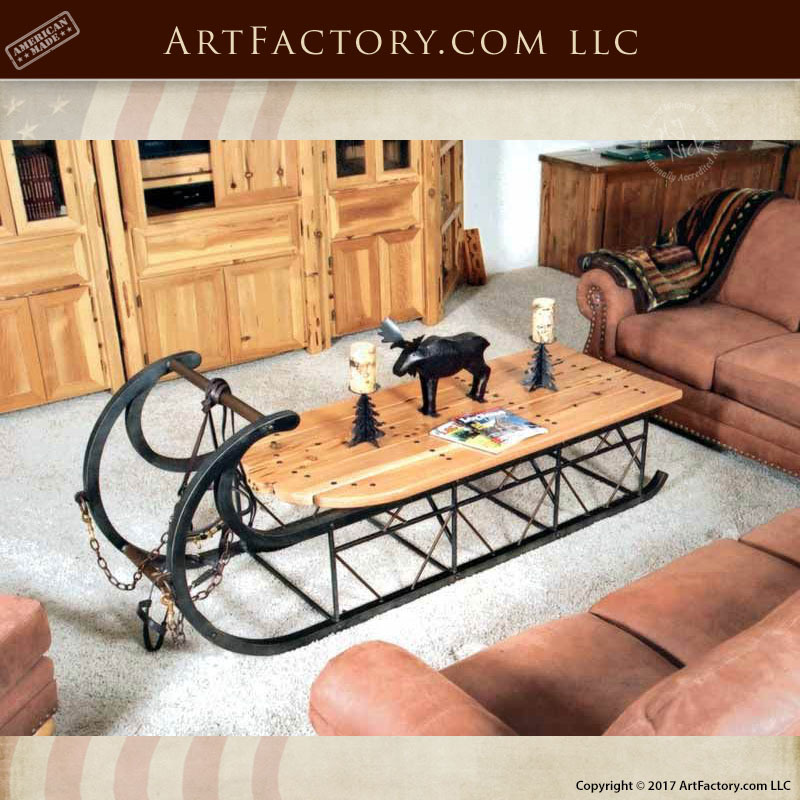 This custom sleigh coffee table, as shown, has a natural colored, semi-gloss finishes, which is just one of hundreds of finish choices available from ArtFactory.com. As pictured, it is built from exotic cedar cypress, but is available in any finish, size, or wood type. It has been modeled to replicate a classic reindeer sleigh, is 100% custom crafted, and has been hand built by our master craftsmen. The solid iron frame, which has been coal fired and anvil hammered, is built with 1 1/2″ square (main runners) and 1/2″ thick diagonal supports. The tabletop of this custom coffee table is hand hewn from six pieces of solid, 1 1/2″ thick exotic cedar which is finished on all sides with multiple coats of non-toxic, clear lacquer. All iron has been finished with a hand applied patina, where we fire raw oxides at over 1000 degrees to create color that is permanently bonded with the metal. This finish will never fade, chip, or crack, and will actually improve with age. The table is fitted with a genuine leather harness for added style and authenticity. All of our custom coffee tables and living room furniture pieces are hand crafted “the old fashioned way”. All of our products are backed by our forever guarantee, and our over a century of experience. Call us today at 1-800-292-0008 for pricing on the custom sleigh coffee table, or any of our other custom, handmade furnishings.